Under the guidance of Press Mag Media, the Communication Workers Union are launching a national print advertising campaign under the ‘Save Our Royal Mail’ initiative. As a free daily tabloid publication, the Metro is seen by the nation’s influential commuting public and offers coverage across 3.5 million daily readers. The Communication Workers Union is trying to prevent the privatisation of Royal Mail. Under the guidance of Press Mag Media, they are launching a national print advertising campaign to inject the public with the fuel to fight this move, working under the ‘Save Our Royal Mail’ initiative. On Wednesday 10th July the Metro newspaper will publish half-page adverts across all editions nationwide, hoping to provoke readers into supporting the CWU. The creative comprises an assortment of recognisable Royal Mail trademarks - such as an imitation brown paper background, the iconic delivery van and stamps emblazoned with the Queen’s head – and features multiple usage of the ‘Save Our Royal Mail’ strapline. The CWU present their argument in conspicuous red copy, including points such as ‘the countryside will be isolated’ and ‘prices will go up’. Social media call to action is featured along the bottom and is accompanied by a web address, encouraging public interaction. Striving to protect those in the communications industry, the CWU is the largest union in this sector with over 200,000 members. 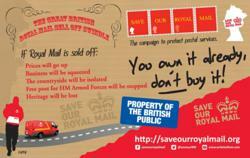 Save Our Royal Mail has been designed to illuminate potential threats and disadvantages that would occur as a consequence of Royal Mail privatisation, campaigning to save part of the nation’s heritage. Directed by Press Mag Media, the CWU are able to effectively receive high-frequency exposure through newspaper advertising. As a free daily tabloid publication, the Metro is seen by the nation’s influential commuting public and offers coverage across 3.5 million daily readers.